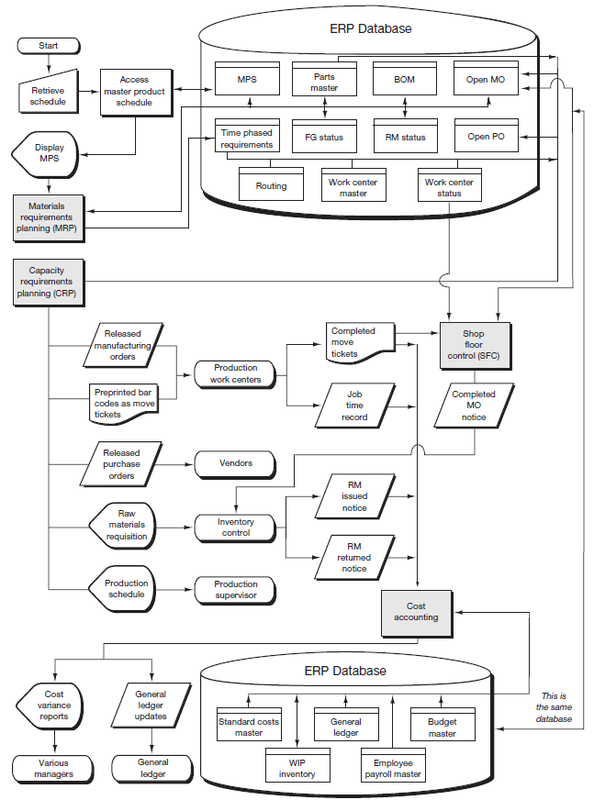 A level 0 data flow diagram of the cost accounting system (Figure 14.8). The remainder of this section is organized into four parts that correspond to the four shaded process rectangles in the overview flowchart in Figure 14.3. The first three processes comprise the production planning and control process; the fourth covers costaccounting. As we examine the details of Figure 14.3, remember that the inventoryprocess is outside the context of the processes we are analyzing. The same is true of the general ledger, the Purchase-to-Pay process, and any other process that does not directly affect work-in-process (WIP) inventory. Materials Requirements Planning The flow of Figure 14.3 starts with the master production schedule (MPS). 2 Recall from an earlier definition that the MPS is the anticipated “build schedule” for selected items. As such, it serves as the set of planning numbers that “drives” the materials requirements planning (mrp) process. What does “exploding a bill of material” mean? By exploding the BOM, mrp determines the standard raw material quantities required to produce the number of output units shown in the MPS. Materials requirements are output in a order requirements schedule. Figure 14.5 illustrates three elements needed to complete production for a universal bearing. Reprinted with permission from SAP. Allowing for the lead time needed to have the parts available during the week of October 4, orders would be released for 500 units of parts 100, 103, and 104, and 1,000 units of parts 101 and 102. 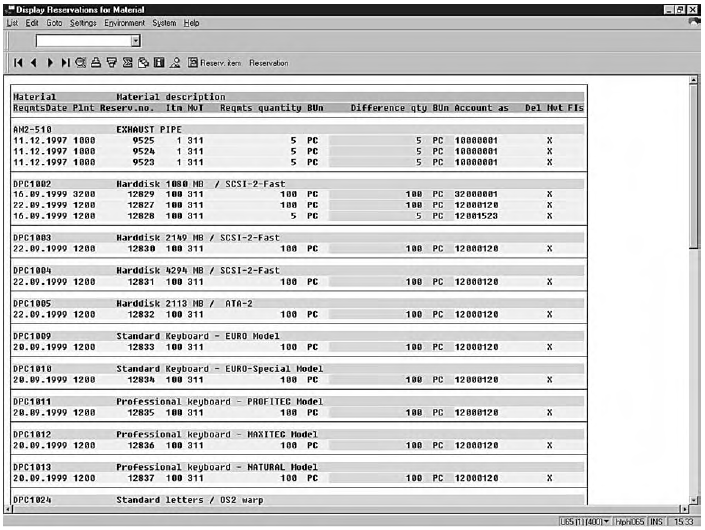 Route sheets stored in the routing data; once again, these data are accessed by first determining basic parts data from the parts master data. Resource capacity information (i.e., hours available each day/week by work center) from the work center master data. Data about the current status of work center loads from the work center statusdata (also known as loading data); these data can include manufacturing orders (MOs) now at each work center, anticipated MOs, backlogs, and actual hours ahead or behind schedule. CRP generates a production schedule and releases manufacturing orders to the factory floor and purchase orders to vendors. The open PO data and open MO data are updated to reflect the released orders. 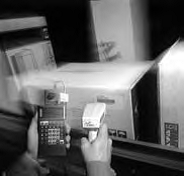 When MOs are released, they are generally accompanied by move tickets (usually in the form of bar code tags); raw materials requisitions are sent to the inventory process. A raw materials requisition is an authorization that identifies the type and quantity of materials to be withdrawn from the storeroom. While the Bill of Materials (BOM) shows the raw material inputs required for a single unit of finished goods output, the route sheet, illustrated in Figure 14.6, performs a similar function in respect to labor and machine requirements. The route sheet (or operation sheet) typically shows the sequence of operations to manufacture an end item and the standard time allowance (labor hours or machine hours) for each operation. Once the time-phased order requirements have been determined, the total standard (required) labor and machine hours can be predicted by reference to the route sheet. The calculations are similar to those used to explode a BOM. The illustration shows that six steps are required to manufacture pump P-100. How are a bill of material (BOM) and a route sheet similar and how do they differ? The material, labor, and machine requirements for each job are reflected in the manufacturing order. The manufacturing order, together with move tickets (that record completed assembly line activities), goes to manufacturing departments and initiates the physical manufacturing operations in the factory. The move ticket contains information for tracing work completion, such as the shop work authorization number representing the job being completed; the department, machine, operator, and time of completion; and check boxes for completion of current task and inspection of prior tasks’ completion. Generally, data are captured by scanning the bar code to expedite data entry and improve accuracy. Although the content of the manufacturing order can vary widely in practice, the typical order contains standard labor hour/machine hour usage allowances. Armed with this knowledge, manufacturing managers can monitor variances from standard as work progresses. They can take corrective action before they receive formal variance reports. After all, the formal reports probably lag behind the actual production operations to a significant degree, and may arrive too late to correct a situation. The production schedule, illustrated in Figure 14.7, authorizes the factory to begin manufacturing specific products. It describes the specific items to be manufactured, the quantities to be produced, and the production timetable. Six months of production plans for this product allow the plant manager to compare forecasted and actual production for the current and prior periods and shows the amount of the product anticipated in inventory during this time. 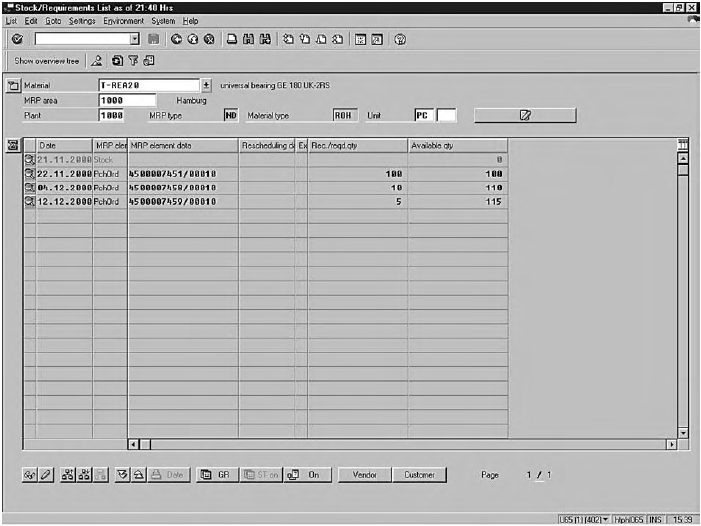 Shop Floor Control Once actual manufacturing has begun, the shop floorcontrol (SFC) process monitors the status of manufacturing orders as they move through the factory. Examine Figure 14.3 to see that as each operation is finished, this fact is reported to SFC through a completed move ticket, and updates are made to the open MO data and the work center status data. 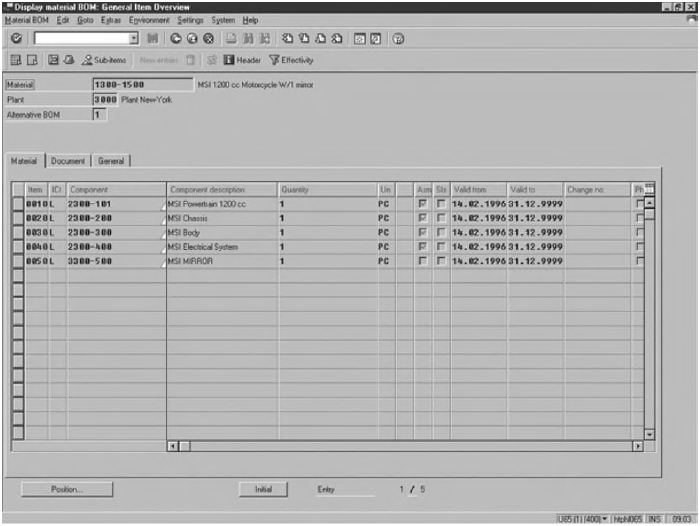 When the final operation in the sequence is finished, the MO is removed from the open MO data, and the inventory process is advised to add the quantities (and costs) to its finished goods records. How are materials requirements planning, detailed capacity requirements planning, and shop floor control similar? Different? Cost Accounting Refer once again to Figure 14.3 to determine the basic inputs, outputs, and data included in the cost accounting process. We could use the overview flowchart as the basis for discussing this process. However, you will understand the process better if we resort to our old friend, the data flow diagram (DFD).Therefore, the following discussion uses the level 0 DFD shown in Figure 14.8 as the vehicle for analyzing the system. In terms of both the system’s logic and the practical implications from a control standpoint, the most important assumption underlying Figure 14.8 is that a standard cost process is used 3. Let’s now examine the DFD, bubble by bubble. 1.0: Record standard costs. 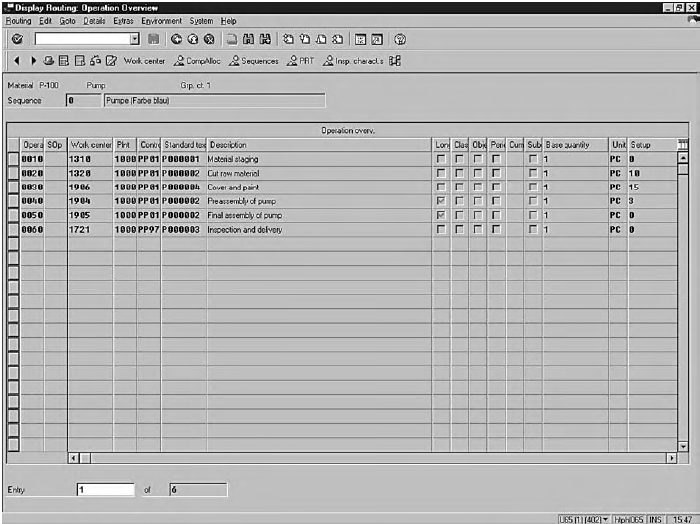 At the time that each manufacturing order is released to the factory, a record is normally created in the work-in-process inventory data. At that point, the record contains identification data (job number, end product description, quantity to be produced, start date, etc.). The standard cost master data contain quantity standards (raw material quantity, direct labor hours, and machine hour allowances per finished unit) and price standards (standard purchase price per unit of raw materials, standard labor rates per hour, etc.). 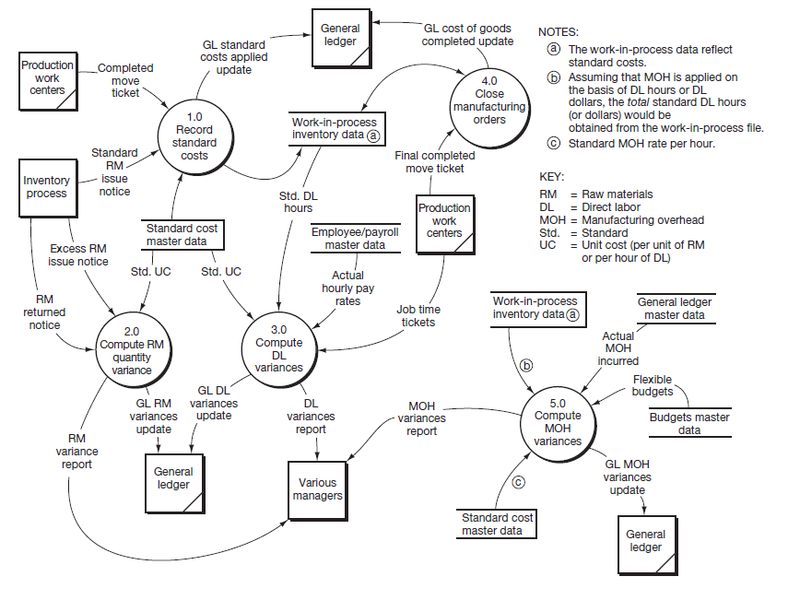 The data flow “Completed move ticket” entering bubble 1.0 occurs at the completion of each operation until the job is completed. Each completed move ticket triggers an update to the work-in-process inventory data for the standard cost of labor and overhead allowed for that particular operation. Standards are obtained from the standard cost master data. When CRP released the MO, it sent a raw materials requisition to the inventory process. The requisition authorized the storeroom to issue the standard release of materials(RM) quantities allowed for the MO. Once the RMs have actually been issued by the storeroom, the inventory process notifies cost accounting that this has occurred (through the data flow “Standard RM issue notice”). This notification prompts an update to the work-in-process inventory data for the standard cost of the materials (i.e., standard quantities times standard prices). A Release of Materials (RM) issue notice is illustrated in Figure 13.9. In a traditional paper process, the issue notice may be a copy of the materials requisition, dated and signed by the storeroom clerk to signify that the goods were issued. Through the data flow “GL standard costs applied update,” process 1.0 notifies the general ledger to make the appropriate entry to apply standard costs to WIP. 4 includes the quantity requested and quantity desired for several computer components. 2.0: Compute raw material quantity variance. In the discussion of bubble 1.0, you learned that RMs were first issued to production in standard quantities. If additional materials are later issued to complete the MO (unfavorable condition) or unused materials are returned to stock (favorable usage variance), these events are reported through the data flows “Excess RM issue notice” and “RM returned notice,” respectively. The usage variance 5 is calculated by multiplying the quantities by standard unit costs from the standard cost master data. This variance is then reported to the general ledger and to appropriate managers 6. 3.0: Compute direct labor variances. The job time log, illustrated in Figure 14.10, is prepared by an aggregation of entries by each factory worker of his or her time on a given job, in this case related to order 451442. It shows both the actual hours worked on specific operations of specific jobs and the budgeted labor hours. This information can largely be captured with an employee card swipe, a bar code scan of the job order, and a few simple entries. The actual hours shown by the job time ticket constitute one of four inputs to bubble 3.0 of Figure 14.8. Employee pay rates are obtained from the employee/payrollmaster data. For each operation reflected on the job time ticket, the standard hours charged are retrieved from the work-in-process data; the standard cost master data provide the standard labor rates per hour. As in the case of raw materials, the direct labor (DL) variances are reported to the general ledger and various managers. 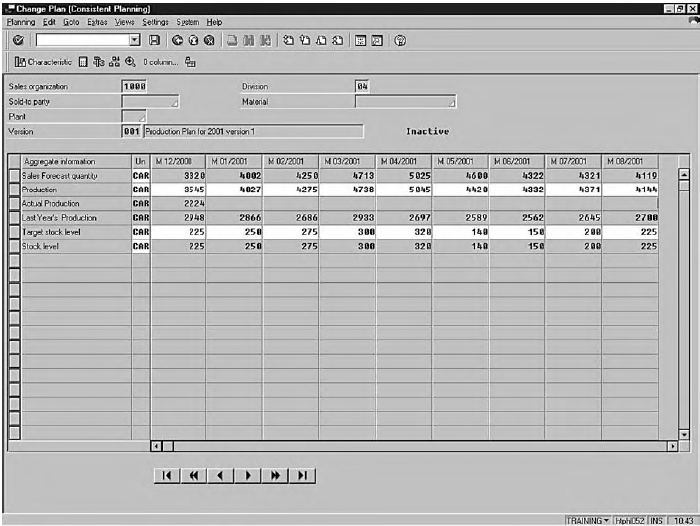 Closing the cost record maintained in the work-in-process inventory data and computing the standard cost of the goods completed. 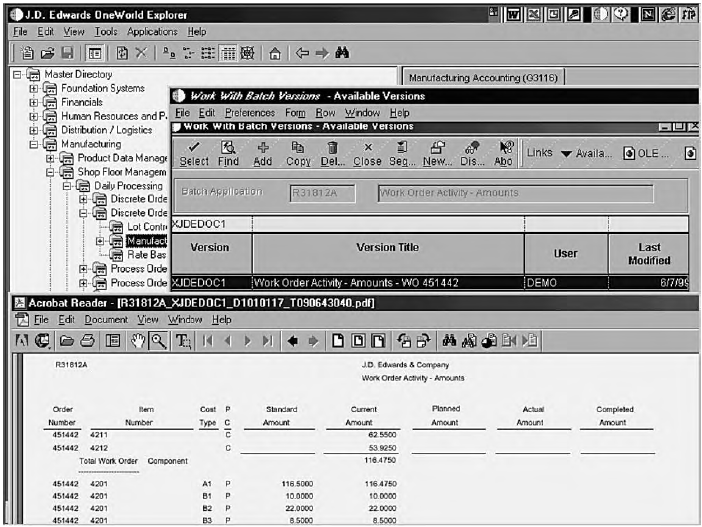 Through the data flow “GL cost of goods completed update,” notifying the general ledger to make the appropriate entries. Obtain the flexible budget from the budgets master data; the budget amount is based on the standard hours allowed to complete the actual finished goods output for the period. Reprinted by permission of JD Edwards World Source Company. Retrieve the figures for actual manufacturing overhead (MOH) incurred from the general ledger master data. Access the work-in-process data to determine the standard hours charged to alljobs during the period; these hours would be multiplied by the standard MOH rate per hour from the standard cost master data. Once again, the variances are reported to the general ledger and the appropriate managers. What are the key processes, data, and data flows in the cost accounting system of a manufacturer that uses a standard cost system?